If nothing goes terribly wrong from this point, we should see opening already during Euro 2016, on June 16. Already today the new SK Rapid Wien stadium is structurally almost complete. Only a small portion of stands in the north is missing, providing a gateway for heavy machinery to get inside the arena. The stands and roof are delivered, while furnishing and installations continue inside the western main grandstand. Last week the more decorative works began. The southern façade is now dominated by giant red sign RAPID included in crest-mimicking circular glazing. Green paneling is also being installed, gradually covering the concrete and steel primary structures. As we did in the past, let us remind everyone that construction of Allianz Stadion is effectively ongoing for just over a year, which represents amazing pace! In March last year the stadium was in early foundation phase, while now vast majority of works worth €53 million ($60m) is done. 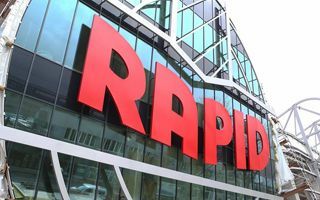 From the 2016/17 season onwards Rapid will have the best infrastructure across the Austrian Bundesliga. Capacity will grow from 18,000+ at the old Hanappi-Stadion to 28,000 (terracing included), while Rapid’s corporate hospitality areas will be by far the best in Austria.